Back by popular demand, New Civil Engineer and Bentley will once again be calling on the industry’s bright young minds to enter the TechFest Graduate Challenge 2018. This year’s challenge will be bigger and better than last year, with 10 enterable teams instead of 5, and a new and improved challenge for graduates to solve! Teams will be tasked with producing a detailed reality model of an area of land from scratch, in just half a day. Each team will have 5 hours to plan and capture images before producing 3D models of existing conditions and providing the required detail within the reality mesh. At the end of the day, teams will have the opportunity to present their findings and results to our panel of expert judges. Following questions and deliberations, the judges will announce the winning team, who will then be invited to attend the evening Awards and collect their Graduate Challenge award. In addition to being presented as the winner live at TechFest, members of the winning team will each win the opportunity to attend Bentley’s Year In Infrastructure Conference in London between October 15 – 18. Send the details of the team you wish to put forward to – Melissa.irving@emap.com - but hurry, entries for the Hack are limited and will close on 3 September. "A lot of youth and enthusiasm, together with great technology produced some remarkably well-thought through and detailed proposals in a very short amount of time. 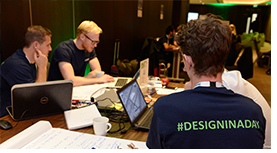 The hackathon really showed us what a team can do with focus and a forward-looking attitude."